KATHMANDU, Aug 24: The second wide-body plane of Nepal Airlines Corporation, 'Makalu', began its first commercial flight to Bangkok Friday. The airbus aircraft (A330-220) with call sign '9NALZ' launched its regular flights, said General Manager at NAC, Sugatratna Kansakar. He said that arrangement of pilots for both wide-body aircrafts has been made and the arrangement of additional pilots was underway. NAC Spokesperson Rabindra Shrestha said that Makalu plane would make flights for Bangkok thrice in a week as per the old flight schedule for the time being. 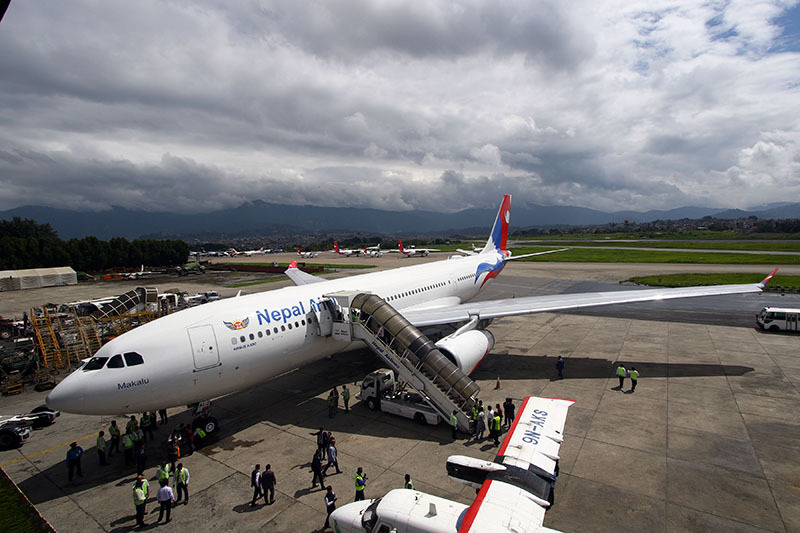 The second wide-body aircraft of Nepal Airlines Corporation had landed at Tribhuvan International Airport in Kathmandu on July 26. Makalu has received Aviation Operators' Certificate (AOC). Similarly, the first wide-body of NAC 'Annapurna' had landed at TIA in Kathmandu on June 30 and started its commercial flight from August 1. The NAC has also planned to operate flights to South Korea, Japan, and Saudi Arabia after completing necessary process. The NAC has been operating flights to New Delhi, Bangalore and Mumbai of India, Malaysia, Hong Kong, Thailand, Doha and UAE.